and no one claimed that any of his possessions was his own, but they had everything in common. I. THEME: The Holy Spirit is at work in individuals and community. When people follow a same ideal or a purpose, they are easy to help each other; such as: the Association of Old or New Testament scholars; the National Collegiate Athletic Association; the Alcoholics Anonymous Organization, etc. The Catholic believers have the same God, Christ, Holy Spirit, the final destination and the law. The Holy Spirit acts in both individuals and community to unite all together and to motivate all activities for the ideal which all are following. Today readings emphasize the role of the Holy Spirit, whom Jesus promised to ask the Father to send him to his apostles after Jesus’ resurrection. In the first reading, by the Holy Spirit’s work and guidance, the apostles courageously witnessed for Christ, the first generation of the believers eliminated individual ownership, put everything in common, and followed the apostles’ distribution. 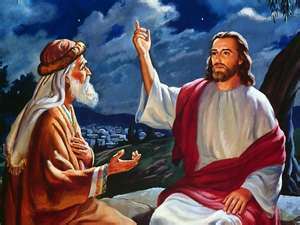 In the Gospel, Jesus declared to Nicodemus that the Holy Spirit works like the wind, no one can predict his power, direction and works. 1.1/ The unity was expressed through the fact that everyone had the same thought and ideal: There are many proverbs which emphasize the importance of the unity, such as: “Unity brings life; separation brings death;” or “unity creates strength.” Members of a community must have the same ideal, thought and direction in order for their community to grow; if not, they shall be divided and each goes in different direction, they can’t achieve great things, and it is very difficult for them to reach the goal which they are aiming at. (1) Follow the Holy Spirit’s guidance and works: Everyone has a different character; but all have the same Holy Spirit who acts in everything and in everyone. (2) Follow the guidance of wise and good leaders: All other ideal groups failed because they trusted their leaders too much. Not all leaders are wise and just. If all the community’s possession falls into the hands of a leader who cares only for himself, the community will die of hungry! (3) Need to avoid the extreme attitude and “everyone does his own way:” The extreme and idealism attitude shall cause angry and separation in the community because not all members have a capacity to do as such. The “everyone does his own way” attitude will also lead a community to separation. 2/ Gospel: People need to be reborn by the Holy Spirit to understand the mysteries of the heavenly kingdom. The wind can bring refreshment for people or creates energy; but it can also destroy houses and cause death for human beings. No one can know for sure where the wind comes from and where it shall head to; because it can change direction and increase its speed anytime. Similarly with the Holy Spirit’s activities in men; he can change and lead an individual or a community to a place or a work which they shall never think of. (1) The mystery of Incarnation: “No one has gone up to heaven except the one who has come down from heaven, the Son of Man.” To believe in both Christ’s divine and human nature, people need to be enlightened by the Holy Spirit. (2) The mystery of Redemption through Jesus’ Passion and Death: “And just as Moses lifted up the serpent in the desert, so must the Son of Man be lifted up,so that everyone who believes in him may have eternal life.” People couldn’t understand why a powerful God wanted His Only Son to go through the way of the cross to redeem people. The Holy Spirit can enlighten human mind to understand this mystery. - When we receive the sacrament of Baptism, we were sealed with the Holy Spirit. We need to live according to his guidance. He shall help us to understand the mysteries of the heavenly kingdom and lead us to the whole truth. - The gifts which the Holy Spirit bestowed on us are for building up the community. Each individual needs the Holy Spirit’s guidance to contribute to the upbuilding and the extension of God’s kingdom.